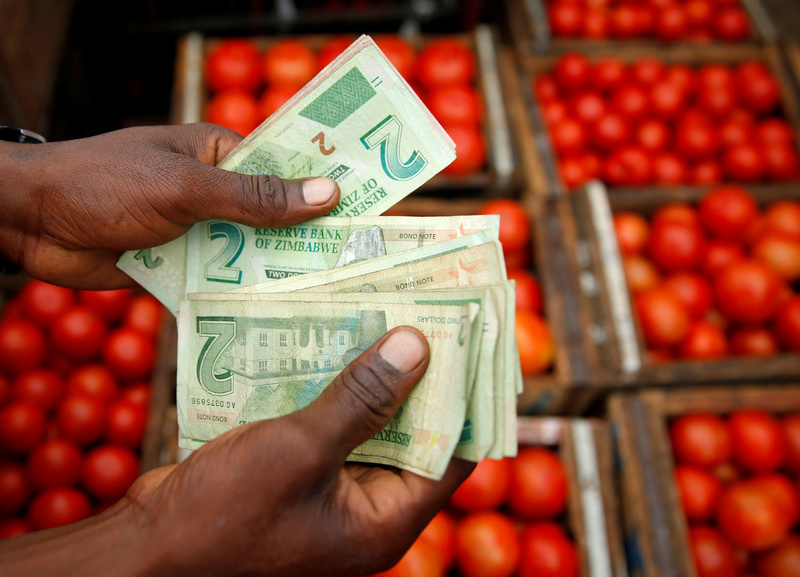 A man counts bond notes at a vegetable market in Harare, Zimbabwe, January 23, 2019. Zimbabwe’s central bank said on Feb. 22 it was devaluing its domestic currencies by 60 percent against the U.S. dollar. Before the devaluation, “bond notes”, a quasi-currency introduced in 2016, and domestic electronic dollars known as “zollars” had a nominal 1:1 face value against the dollar. However, on the black market both units had been trading at a discount of as much as 75 percent against the U.S. currency due to a chronic lack of foreign exchange. Harare scrapped the Zimbabwean dollar in 2009 after it was rendered worthless by hyperinflation that topped out at 500 billion percent. In its stead, it adopted the U.S. dollar and South African rand.